I was so excited to find this claw foot or Chippendale / Queen Ann style sofa table / hall table / entry table for a great price, and originally envisioned it being green like my favorite Bombay demi-lune console table refinish. However, I was so busy with custom orders that I wasn't able to work on this one for a while, and had the opportunity to mentally envision this table in a whole host of other colors. So I decided I'd take a flash Facebook poll! When one reader suggested it be bright red, "Like a fabulous pair of heels!!!!" I was sold. Let's just say it appealed to the girly girl inside of me (somewhere, probably covered in paint!). I was also thrilled to get to pull out the can of Annie Sloan chalk paint in Emperor's Silk that hasn't gotten to stretch its legs in far too long. This color goes on super bright - almost a fire engine red - but does darken a bit when it dries. I also lightly distressed, which can be.. well.. distressing, because the areas that you kiss with the sanding block will pull up a fine light pink powder. The key is not thinking this is the final color! When you apply the clear wax it not only gets a beautiful rich sheen, but also a deeper color. 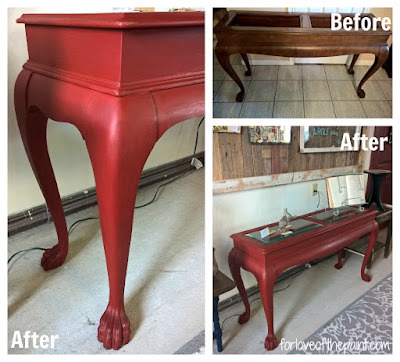 This is beautiful on its own, but I have a great love for these bold colors with some antiquing, so I also followed with dark wax as well. Isn't she lovely?? I adore this bold red look, especially with the slightly greenish hue to the beveled glass insets. What a gorgeous contrast! Bold colors on traditional styles can really blend well into both a more classic decor, or pop in a modern home! Do you have any questions about how I achieved this refinish? Add a comment and I'll be happy to detail my process further. Or tell me what color YOU would like to see next!